I understand how a warship's turrets are armored against Gunfire, but what about the actual barrels of the guns themselves? Are they armored too? What would it take to knock out the barrel of a large caliber naval gun? was this something that ever happened? 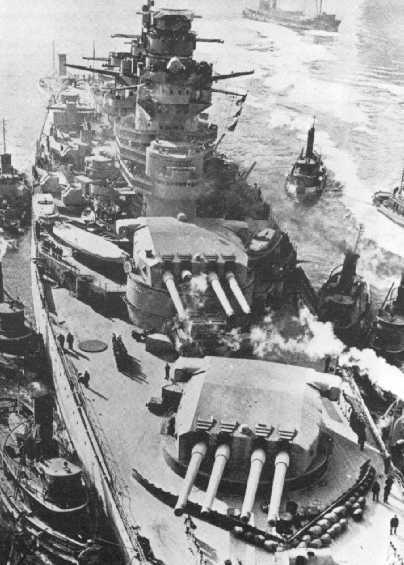 As an example, at Denmark Strait, Prince Eugene's guns couldn't penetrate Prince of Wales' turrets, but what would happen if one of those 8" shells hit one of the barrels? If memory serves this happened to Seydlitz during the Jutland battle 1916. Robert Lundgren and Nathan Okun have criticised that report, commenting “For these reasons, the preparation of the damage report had been given a very low priority and the late date of its publication and the paltry seven sources listed as being used in writing it are a reflection of just how low a priority it had.” However, the criticism tended to centre on what types of shell had hit rather than the damage itself. Actually, I didn't know. Thanks for the more accurate info. Francis Marliere is right, the gun N.7 of turret II of Richelieu was damaged by the premature explosion of the shell inside the barrel during the engagement against Barham and Resolution when at anchor at Dakar. Similar (but less spectacular) problems happened to gun N.8 and later to N.5, always in turret II with standard charge SD21. The cause of the problem was analyzed by an official inquiry and conclusions are posted below (from Jordan-Dumas book "French Battleships" pag.149). The propellant change (initially suspected to be responsible due to two different charges (SD19 and SD21 being used, SD19 re-manufactured in emergency) was not the cause, instead it was the shell design, with cavities (that were initially intended to host toxic gas) and that generated a weak point in the shell, that could be detonated by the pressure of the gases of the charge, already increased by the high temperature inside the turret. Turret I was safe only because the re-manufactured charges (SD19 was initially intended for Strasbourg 330 mm guns) were under-powered. The problem was solved filling the cavities with cement and applying more resistant caps to them. Peeling back like a banana sounds more like a in bore explosion. I wonder what other observation or evidence us available here.